There is a strong sense of déjà vu for refugee rights activists. Many of the battles waged against the Howard government, like opposing long-term detention and Temporary Protection Visas, are again urgent priorities. So too is the strategic importance of breaking bipartisan support for offshore processing, which this time is underpinned by a phoney humanitarian argument that “preventing deaths at sea” justifies deterrence, no matter how brutal the consequences. Compared to last time, dissenting Federal Labor MPs (Melissa Parke, Anna Burke, and Sue Lines) have quickly found their voices—although the first attempt to commit the Labor parliamentary caucus to scrap offshore processing failed. ALP state conferences in WA, Victoria and Queensland have already passed motions opposing offshore processing (in NSW, the Right diluted the resolution). In many ways, however, the movement’s task this time is more difficult. Labor as a whole is deeply implicated. In 2012 it was the ALP Prime Minister, Julia Gillard, who enthusiastically reopened the Pacific Solution hellholes (with support from left MPs). And it was Kevin Rudd, not Morrison, who first insisted that no asylum seeker arriving by boat would be resettled in Australia. This legacy underscores the pathetic responses from Bill Shorten and Shadow Immigration spokesperson Richard Marles to the horror of Manus Island and Nauru; and the deaths of Reza Barati and Hamid Khazayi in particular. Their criticisms have focussed on centre mismanagement and government secrecy—with the implication that Labor does deterrence so much more nicely. When Morrison visited PNG after Reza’s murder, Marles challenged him not to allow Australia to go back on the table as a resettlement option for refugees. In May, Marles told the National Press Club, that Labor would, “…keep offshore processing…because it is the single most effective deterrent in seeing people not risk their lives at sea”. It’s therefore welcome that Labor for Refugees has published The Drownings’ Argument—Australia’s Inhumanity: Offshore processing of Asylum Seekers—a collation of articles by refugee advocates as well as Labor MPs Melissa Parke and Anna Burke. Julian Burnside rightly points out that, “It opens the way to mistreat asylum seekers who have not drowned, and helps them pursue the darker purpose of keeping refugees out”. He usefully outlines how deterrence has gone through three phases since 2001: the “illegals” argument under Howard; Rudd’s demonisation of people smugglers from 2009; and the “stopping deaths at sea” argument since the Christmas Island crash tragedy in December 2010. Many contributions call for a higher refugee intake, well in excess of the 20,000 per year that Labor brought in (now cut back to 13,750). Ben Saul argues for Australia to substantially increase support for the UNHCR in Indonesia and Malaysia, so that resettlement could be guaranteed within a short time frame. It’s a point reinforced by Misha Coleman from the Australian Churches Refugee Taskforce when she condemns the huge cost of Operation Sovereign Borders, including the incredible statistic that, “In 2013–14 Australia will spend almost two-thirds as much locking up in detention a few thousand people seeking asylum, as the entire UNHCR spend in the last financial year assisting tens of millions of refugees and asylum seekers worldwide”. Yet some of the articles make unnecessary concessions. Presumably this is in the hope of finding more “reasonable” alternatives that might be palatable to “middle Australia”. For example, Julian Burnside again puts forward his idea that after a month in detention, asylum seekers would be required to live (and work for low wages) in rural country towns. Marg Hutton and Tony Kevin meticulously expose how a large number of drownings could have been prevented by a more swift response to boats in distress. However, in Marg’s otherwise excellent piece, she unnecessarily suggests that Manus be used to detain people smugglers—despite knowing full well that convicted “smugglers” are overwhelmingly Indonesian fishermen, that smugglers service an urgent need, and that many (such as Ali Jenabi) have had strong altruistic motivations. 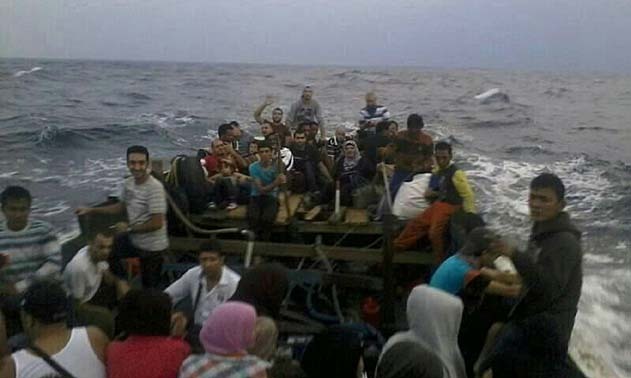 The Drownings Argument provides plenty of ammunition to combat the “deaths at sea” argument. However, the refugee rights movement needs to remain completely opposed to both offshore processing and mainland detention—the whole system of deterrence and border protection must be dismantled.